Yesterday morning, Duncan and I watched in amazement as Owen engaged in his very first game of make-believe. He took the closed bubble bath bottle over to the empty bathtub, and tipped it over, making a “psssshhh” sound. As we watched, he put it back in the cupboard and then went back to the bath to “pour” it in several more times (evidently enjoying our enjoyment and cheers). I had no idea that a child Owen’s age could pretend to do something. He pretends to sweep the floor, but it’s more because he’s not a very good sweeper that it’s not real. He plays with toy trains, but since he has had hardly any exposure to real trains, there’s no reality he can compare it to. He’s more interested in the magnets that hold the trains together than in making them go around the track. Owen’s foray into the world of the imaginary made me think about Daniel Keyes’s short story (and later novel and play) “Flowers for Algernon.” The short work of speculative fiction is told through a series of progress reports through the voice of an initially mentally challenged man, Charlie Gordon, who has an operation that triples his IQ. After the operation, what is more remarkable than Charlie’s improved spelling and vocabulary is his ability to understand figurative, rather than literal language, and his ability to imagine. I hadn’t really considered (before reading that story) how important the imaginary is to intelligence. Don’t worry – I’m not getting all carried away thinking my son’s a genius. (Brief digression: At the Children’s Museum in London in the “doctor’s office” exhibit, there were posters up about how if your child hadn’t spoken 20 words by 18 months, you should consult your doctor. That kind of incendiary provocation infuriates me – so much like all those baby books that tell you that everything you are doing is wrong. Of course, it also worried me. 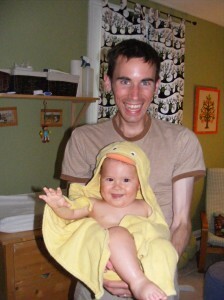 Owen will be 18 months old on December 21 and has MAYBE 5 words. If you count “uh oh.” He communicated with language for the first time yesterday, asking his dad for his “sus” (pacifier). So he’s not a genius but he’s also not cause for alarm, you irritating poster people). Imagination, though, is to my mind a more impressive development that language (which will come in its own time, I’m sure). One of my favourite books as a child was Josephine’s ‘Magination, in which a very resourceful child makes dolls out of her mother’s broom scraps (her mother makes brooms for a living). Her imagination allows her to transcend and transform her everyday life. As he develops his imagination, Owen will gain another entire world, layers of worlds, and the capacity to transform his surroundings. He will also develop his own inner life, one that I cannot access, taking another small step away from me (as I cheer him on). So begins PEEPO! 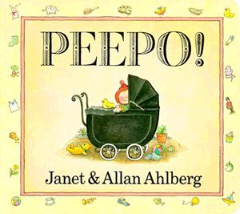 by Janet and Allan Ahlberg, a board book that gave me more hope and perspective on parenting than all the parenting books I read combined. The lesson? Your baby doesn’t have to be entertained every minute. It will get to a point where you will be able to put your baby down and he will watch you as you go about your daily business! The book is rich with detail. In the first scene, you can just glimpse the dress that the mother will wear throughout the day, and spot the rubber ducky that will appear in the evening bath scene. The clutter is encouraging (other people have messy houses too!) but also really fun to look at. It’s interesting historically, too, since it’s set in 1940s England (there’s a barrage balloon!). And then once Owen could finally sit on his own, oh my goodness! it happened! He could play by himself! 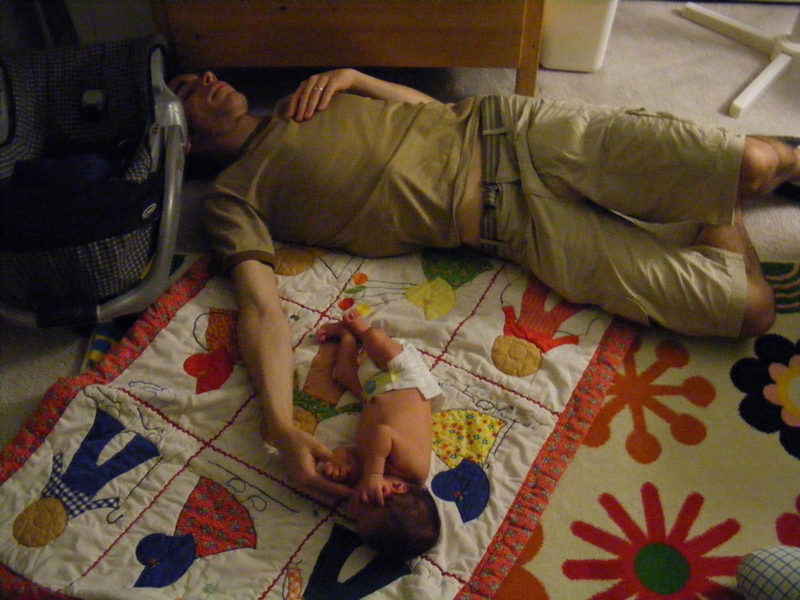 And then he learned to crawl and stand and it was all over. Well, not entirely – outside is still OK. Inside seems like a minefield, though. Today he fell and hit the side of his head on the coffee table (we padded the corners, but not the sides – gah). But it’s coming, and I do have a little boy who stands in his cot and waits for me to come and get him in the morning, and when I peek around the side of the door (PEEPO!) I see the biggest grin every single day.